There's many exciting aspects of Scottish salmon fishing but none more so than catching a fresh run 'fighting fit' Spring salmon on a fly rod. We're now fast approaching the start of the 2018 salmon fishing season and these fine Spring salmon will already be present in the bigger Scottish salmon rivers. There's big excitement too for many thousands of Scottish river salmon fishers in getting ready for the new season and double checking rods, reels, lines & tying up a few fresh salmon fly patterns for the high cold water conditions of Spring. Most of us who are afflicted with 'Spring salmon fever' count down the days of Winter to getting back out with a fly rod in our hands. The River Tay kicks off its 2018 salmon fishing season on the 15th of January and the other big Scottish rivers follow during early February. There's much 'pomp & ceremoney' on all of the river opening days and the drams always flow. River management & the owners of the various salmon beats usually always show up and participate in the day too. Under the surface of the river there's many kelts present through the early Spring which are salmon that have already spawned during the Winter months. Many of these 'respected' salmon will eventually smell the salt of the ocean again. Lying unnoticed in amonsgt the kelts will be the often shy 'beefed up' and most perfect salmon of all the 'Springer'. The professional salmon men of Scotland will know exactly & intimately where their early Spring salmon lies are located on their beats and will no doubt have been watching the water for the weeks and days leading up to the opening of the river. Many of each salmon beat's regular salmon fishers will have also worked out the jigsaw of where Spring salmon will be holding so drawing straws is often the only way to keep pool fishing rotations fair for all. In the early cold Spring river water and even when you're catching or getting constant dunts from the kelts treat each knock on the fly with suspicion and complete respect. 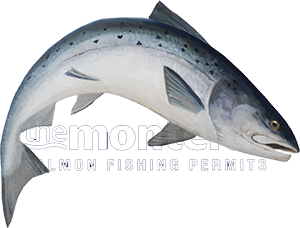 On many occasions while fishing the early months of the season the most insignificant and gentle salmon take has turned out to be that perfect and sometimes long awaited Spring salmon.